Your superhero Ben 10 is again on a mission in Ben 10 Power Splash game. This time it is to save Gwen who has been kidnapped by enemies. Ben must chase them down as they escape through the ocean. With Ripjaws and Stinkfly at your side, saving Gwen is your mission! 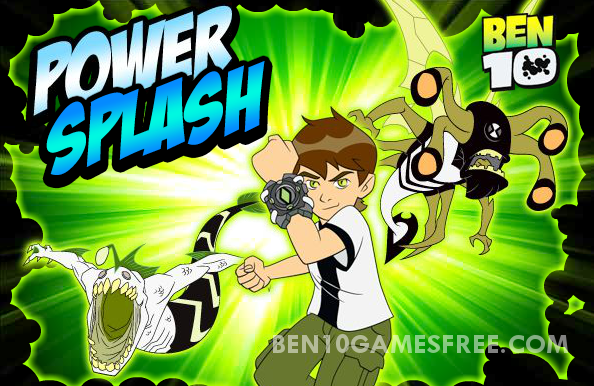 Ben 10 Power Splash game features two very powerful aliens from the Ben 10 Alien Force franchise. Ripjaws is a mutant-fish aquatic alien while Stinkfly is a mutant-wasp alien. As the kidnappers take away Gwen, Ben follows them by transforming into these two aliens and attack them to rescue Gwen. Recommended: Play Ben 10 Alien Force games online for Free! Ben 10 Power Splash is a continuous ben 10 game without any levels or stages. The game begins when three men kidnap Gwen from the port in a motorboat. Ben transforms into Ripjaws and follows their motorboat. Under the water, you have to face the deadly squid regiment. These squids will attack you and to continue following you must kill them with Ripjaws powerful bite attack. When Ben comes closer to motorboat, he transforms into Stinkfly. And you have to attack three kidnappers with Stinkfly’s deadly slime attack. If your health as indicated in the top left health bar goes down to zero, you die. And you have to start the chase all over again. That’s all about Ben 10 Power Splash game, now it’s time to get to the mission. With Ripjaws and Stinkfly at your side, save Gwen from the Unknown Kidnappers to Win! Don’t Forget to give your rating for Ben 10 Power Splash game and share your tips and tricks to win this game in the comments section below.